The table below plots the last 20 quarters (5 years) of quarter-on-quarter GDP growth. 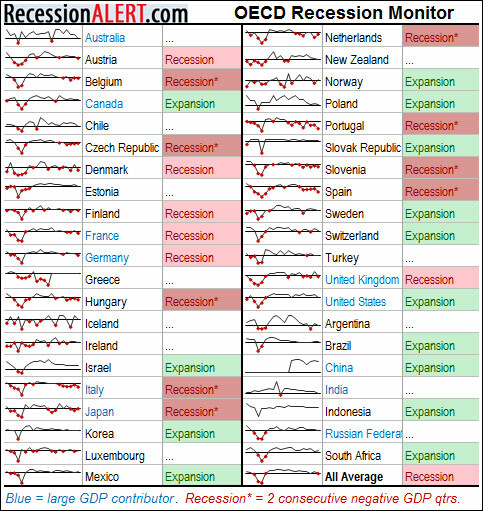 With most of those countries still outstanding fresh data (tagged “…”) hovering on the brink, there are going to have to be some hefty upward revisions and re-estimations to improve matters from here. 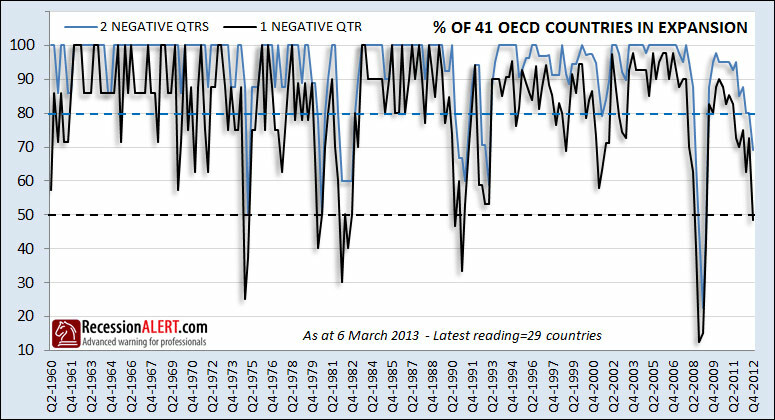 It is interesting to note that the equally-weighted average GDP growth has now fallen into negative territory for one quarter, although the GDP-weighted one has not. We continue to monitor the US NBER Recession Model and the GDP/GDI Recession Model closely for clues on a current U.S recession. As we forecast a month ago, Personal Incomes plunged as a result of all the stuff pulled forward before the Fiscal Cliff Tax debate which made things worse for the NBER Model, but the GDP/GDI model improved with the -0.1 to 0.1 GDP 2nd-estimation and an upward revision to 3Q12 GDI. But its all very much uncomfortably “on the brink” at the moment. Looking at the strong showing of the 9 components of our US Long-Leading Index (which never signalled recession but did come on the brink 18 months ago), we can only conclude we will either enter a mild recession or experience a “soft landing” before resuming expansion. For now, the stock market seems to be coming to the same conclusion and happily continue on its liquidity-fuelled rally. Marijuana: Lucrative Leaf or Harmful Herb?